The best rice to use here is short-grain Japanese-style rice, also known as sushi rice. At about $2 a pound, this rice is expensive compared to cheap rice, but not expensive compared to, say, any other food. This dish — adapted from the book [%amazonProductLink "Mouth Wide Open" asin=0865476284], by John Thorne, and from a dish served at the now-closed Seattle restaurant Takohachi — is wonderful topped with two fried eggs. In a wok or well-seasoned cast-iron or carbon-steel skillet, cook the bacon over medium heat until it has released considerable fat but isn't quite crispy, about 5 minutes. Raise the heat to high. Add the scallions, garlic, and ginger. Stir-fry a few seconds, until fragrant, then add the rice. 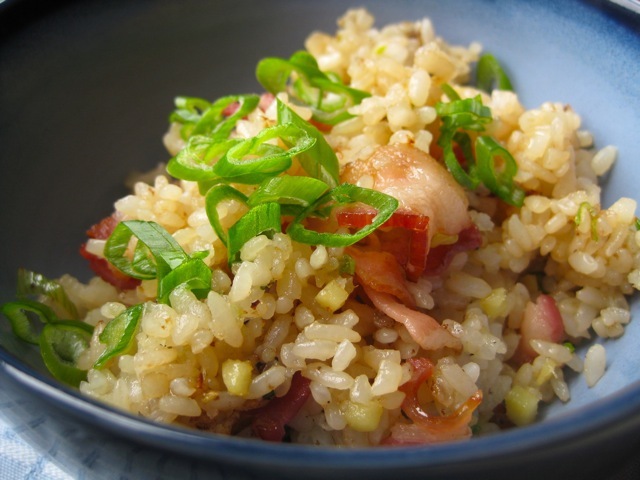 Stir well to incorporate the aromatics and bacon and coat the rice in fat. Drizzle in the rice wine and soy sauce and add the pepper flakes. Continue stirring and turning the rice constantly, lowering the heat to medium-high if the aromatics seem to be browning too fast. Cook 3 to 5 minutes, or until the rice grains are clearly beginning to brown and take on a hazy appearance. If you're not sure whether you've hit this point, taste. You'll know. Stir in the sesame oil and serve immediately.